Despite the recent cold weather, I think it is safe to say that Spring is here! Tis the season for flowers, and picnics, and hikes and CRAFTING, obviously. Which brings me to today's DIY: planters. Break out your old mason jars because I am going to teach you how to make gold leaf planters in a matter of minutes. These marbleized coasters are A-M-A-Z-I-N-G. Who ever thought clay could look this good? I was inspired by Sarah Johnson to make these, and I am absolutely in love with the way that they turned out. I'd have to say, my kindergarten clay modeling skills have come a long way and I bet yours have too! Details on how I made these beauties are below. PAPER. RIBBONS. Need I say more? My mom taught me how to make these in college and I have been making them like crazy ever since. You can use them to accessorize your office bulletin board or to up your gift wrapping game. The possibilities are endless. I am so excited to share this post with everyone! This is by far one of my favorite projects to date. I have always been a lover of antique milk glass and I figured out a way to replicate the 3-dimensional aspect with liquid glass. The best part about this DIY, on top of it looking like something you picked up at Homegoods, is that the entire project is under $10. Who ever thought desk organization could look this cute? This DIY is super simple and is a creative way to re-purpose your old mason jars. Whether you fill the jars with loose change or candy for a party favor, the animal lid toppers are surely going to create a stir, as in DIY envy. I have a tray obsession and it is kind of a problem. They are living under my bed, on top of my refrigerator and in my cabinets. I was recently walking through Target and spotted this Tree Bark Server. I decided that it had to be made into a tray, as if I need another one. 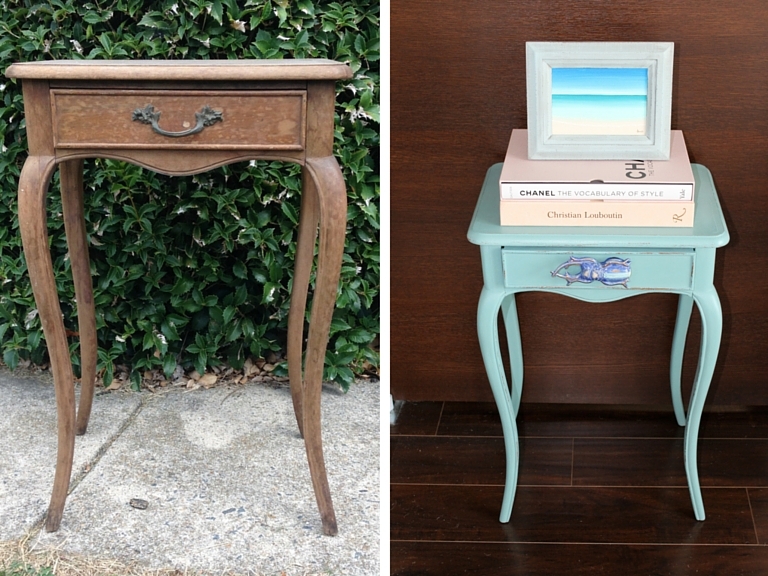 It’s truly amazing how a little paint and new hardware can bring an antique back to life! This was a side table that I scored for free from a friend. Check your neighbor’s curb on trash day or visit a flea market on the weekend. You will be sure to find a diamond in the rough for next to nothing. From chandeliers to sculptural elements, antlers make for the perfect rustic, yet chic decor. You can buy various types of antlers for super cheap online and use them to make all sorts of fun crafts. My mom found my antler on the ground when she was walking around our family farm. You too may also luck out and score one for free!